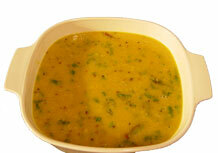 Masoor daal or lentil soup is the most commonly used daal in India. We have used a pressure cooker to cook this daal. In doing so we have realized energy saving and more spicy taste, as the cooking is done in a closed container. Measure 2 cups of split masoor bean in a large pot. Rinse with water and drain. Depending on the source of the daal, it may need multiple washings. Then leave it aside. 12. Put the lid on the pressure cooker and let pressure build up. When the steam starts whizzing out, let it allow about 1 minute. Then turn off the stove. But leave the pressure cooker on it so the leftover heat will cook the daal. This will take around 30 minutes depending on the model of cooker for the pressure valve to release. If you do not want to wait for 30 minutes you may want to heat the pressure cooker for 5 minutes after steam starts whizzing and then manually release the pressure. 14. Add the chopped cilantro into the daal and mix. 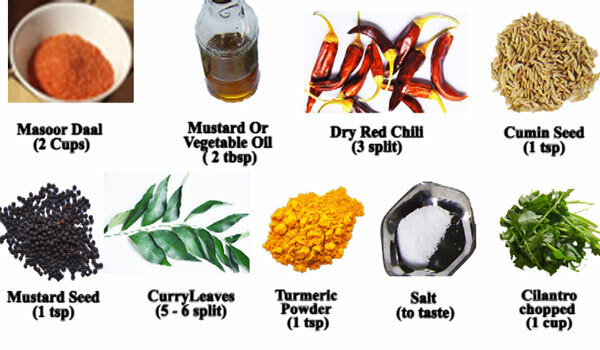 This completes the Masoor daal preparation. It takes about half an hour to cook and serves about four to six people. The lentil can be served as a soup by itself. Or it can be served with rice and chapatti as in an everyday Indian meal.